For many fans, appearing in a Star Wars film is something they would say yes to in an instant. For Domhnall Gleeson it was decision that required some extra thought. Gleeson is out promoting his new film Goodbye Christopher Robin and, of course, he's getting a lot of questions about Star Wars. 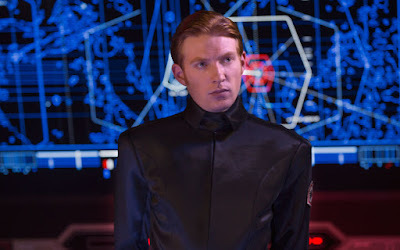 Gleeson was interviewed by the Radio Times recently and shared his reaction to finding out from director JJ Abrams that he had been cast as General Hux in Star Wars: The Force Awakens. "Why would I have thought of saying no? Fame is the end goal for a lot of people but it is not mine. I worried that the accompanying fame would get in the way of how I live my life. (...) It got a little crazy for a couple of months – for a while, going out and having a drink with my friends was difficult, and then it died down." Gleeson's hesitation came from having seen first hand what a "famous" lifestyle was like, having grown up with a famous father (Domhnall is the son of Brendan Gleeson, who has appeared in many high profile films, including the Harry Potter series). Fortunately, he said yes and Star Wars gained another great performance. Gleeson returns as General Hux in Star Wars: The Last Jedi this December 15th. Before that, you can catch Gleeson as Winnie the Pooh creator A.A. Milne in Goodbye Christopher Robin, in theater now in the UK and on October 13th in the US.